Bridge is a very popular game and is widely played around the world. It is played online, it is played in clubs, it is played in people’s homes. It is so popular that virtually every cruise ship has a bridge card game room and many bridge holidays are run in a variety of venues around the world. It is fun, it’s sociable, it’s a great way of meeting new friends and keeping your brain active. So it isn’t a surprise that each year many people decide they want to learn how to play. Here are a few hints, tips and some basic rules to get you started. To play bridge you need four people, a table and a standard pack of 52 playing cards (you discard the jokers). The players form partnerships and partners sit opposite each other. Each player is assigned to one of the four points of the compass as they sit around the table. East & West are one partnership and North & South are the other. At the start of a game, each player is dealt 13 cards. They sort the cards into suits and then value their hand. To value a hand the player counts 4 points for each Ace they hold, 3 for each King, 2 for each Queen and 1 for each Jack. A, J 10 5 Spades, K Q 7 Hearts, Q J 6 5 Diamonds, K 2 Clubs. You hold 1 Ace (worth 4 points), 2 kings (worth a total of 6 points), 2 queens (worth a total of 4 points) and 2 jacks (worth a total of 2 points). So the value of your hand is 16 points. Bridge is a trick taking game and each trick comprises 4 cards – one from each player. At the start of each trick the player who won the previous trick plays a card. 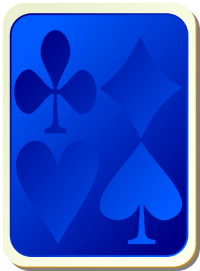 The other players must play a card from the same suit, if they hold one. If they don’t they can play another suit. If a “trump” suit is being used, playing a card from the trump suit will win the trick, provided another player doesn’t play a higher trump card. Whether or not a trump suit is being used is decided before the card play starts, when the players make their “bids”. The aim of bridge is to win at least the number of tricks that your partnership has said it will make if you win the bidding. The main aim of the bidding is to give your partner information about the content of your hand to help you decide how many tricks you think you can win. In the bidding, players bid in a clockwise direction. A player won’t open the bidding unless they hold at least 12 points in their hand. If all players hold fewer than 12 points then the cards are redealt, although the final player has the option to open with fewer than 12 points if they feel their hand merits doing so. Once a player has opened the bidding, there are two main decisions to be made. The other partnership has to decide whether to bid against the opener and their partner, or whether to let the opener and partner continue bidding unopposed. Meanwhile, opener and their partner are trying to exchange information about the make-up of their hands to decide how many tricks they think they can win. Those are the basic rules that it is helpful to know before learning the intricacies of the bidding. Practice. As with many things, practice is the best way of learning. If you enrol on a class or take lessons online, it is very helpful to try and play in between sessions. There are many websites or downloadable apps which allow you to play bridge against “robots” or dummy players. The great thing about the robots is they have infinite patience and really don’t care if you make wrong moves. A great way of learning and having fun in the comfort of your own home. Don’t spend too long on each learning session. If you find yourself spending too many hours at one time trying to learn a topic you will stress yourself and start to get muddled. For beginners one hour at a time, if you are learning at home, is quite long enough. Take a break. If you try to learn too much at once you will simply forget it all. Revision. If you enrol on a local bridge course, try to go through the topics you have learnt before the next lesson. This, along with some home practice play, will help you remember the topics that you learned. Don’t try to get ahead of your teacher. Take it slowly – that way you will learn more in the long run. The best way to practice and revise between classes is to join No Fear Bridge where you will find fun, interactive lessons, tutorials, quizzes and much more. Finally. Enjoy yourself. Bridge is fun and sociable. You will meet new friends and keep your brain active.